This is a reprint of an article that I wrote for QUILT magazine in 2000 while still living in SC. This article and the huge response from quilt lovers and cat lovers all across the country, was the inspiration for the shops name.
" 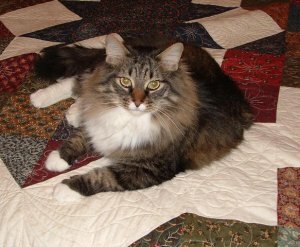 EVERYTHING I KNOW ABOUT QUILTING I LEARNED FROM MY CATS"
Everything I know about quilting, I learned from my cats, and with 32 wonderful furry friends, that’s a lot of learning. Now before some of you start to point a finger, let me add that all 32 are spayed or neutered, have all their current shots, were all rescued from various circumstances, and have their own 24’ x 24’ "kitty house"- heated and cooled and equipped with everything a kitty could ever want as well as the run of over an acre of land. Growing up, I had always felt a great sadness for abandoned and abused cats. I always said that "when my ship came in", or," when my rich uncle died", I would build a shelter and take care of any that came my way. Well, a few years back my mother finally broke the news....I don't have a rich uncle, and I live too far inland for my ship to come in. With that, I did the only sensible thing I could do. I mortgaged the house and did it anyway. Cocoa and Sampson are just two of my 'babies'. Both were thrown out of cars at approximately 4 weeks of age and left for dead at the side of the road. One year later and with lots of TLC, both have become beautiful, healthy felines, who have captured our hearts. A few weeks ago as I sat and watched them play, Cocoa seemed intent on retrieving something from under the old ice box in my kitchen. He worked for what seemed like hours until finally his goal was completed. He had been after his fuzzy ball. Happily, he played and played. Every so often, he would cross the room, look back at his fuzzy ball, study it, and then run and pounce on it. After a while he slapped it back under the ice box, and the game was over. Quilting Tip # 1 (by Cocoa ) - Sometimes you just get too close to the subject. Maybe you aren't sure if the colors you've chosen are right, or if you really like the design. In that case, take a minute, go across the room, and view it from a distance. You might find that it looks great from back there. If not, use Cocoa 's example. Put it on the floor, run and jump up and down on it a few times, and when you are satisfied, slap it back under the ice box (or to the back of the closet), where you don't have to look at it anymore. Sampson is our acrobat. It never ceases to amaze me how that little furry body can bend itself into so many positions, or sleep in so many awkward ways. The other day while I was sewing, the phone rang. When I returned to my machine a few minutes later, Sampson was fast asleep with his body through the middle of the machine. I ran to get my camera, but of course he had moved when I got back. Quilting Tip #2 from Sampson- Don't take things so seriously. Sometimes we get so caught up in the dos and don'ts of quilting that we forget to enjoy the process itself. Instead of relaxing while we sew, we feel pressured to have our quilts look just like the perfect examples we see in books or magazines, and we lose the joy of creating. Stop trying to be somebody else. Just sew, relax, and enjoy. Sampson sure did. Lastly, I mustn't forget Tabby. As a baby, I compared her to the energizer bunny. She kept going and going and going. Playtime to her meant doing whatever you were doing at full throttle. If you're running from room to room, do it fast and hard. (And sound like an elephant.) If you're going to climb the curtains, go all the way to the top. (And look smug when you get there.) To Tabby, anything worth doing was worth doing with all your energy. Quilting Tip # 4 from Tabby- Approach your quilting with Tabby's example. Give it all you've got, and strive to make every new design better than the ones before. You'll be glad you did. I could go on... (After all I still have 28 more examples), but I think you get my point. Cats and quilts.... a perfect combination. Soft, warm, and comforting, truly two of life's simple pleasures. I moved to NC in June of 2002 and opened Deb's Cats N Quilts in 2005. Most of the furry children I refer to in the article were adopted by loving homes before I moved. Others, made the move with me. Many of these were seniors, or "Special needs kitties" who have crossed the rainbow bridge since that time. I currently shares my home with just 3- Gracie, who was found in the alley behind the shop in 2007, Lily found sitting on the center line of a busy road in 2010, and Lacey a feral that was caught during quilt retreat 3 years ago. Maggie, a rescued Collie/Aussie mix, joined the felines a few years ago and rounds out the family. Since I no longer have a facility to do rescue work myself, I focus my support on CatMan 2, a no kill feline shelter in Cullowhee, NC. For more info on the great work at Catman2 visit www.Catman2.org. You can also follow Catman 2 on Facebook.